Life goes by, a day at a time, seemingly fine. And then, suddenly, things go downhill fast. I have 2 really adorable rescue dogs. 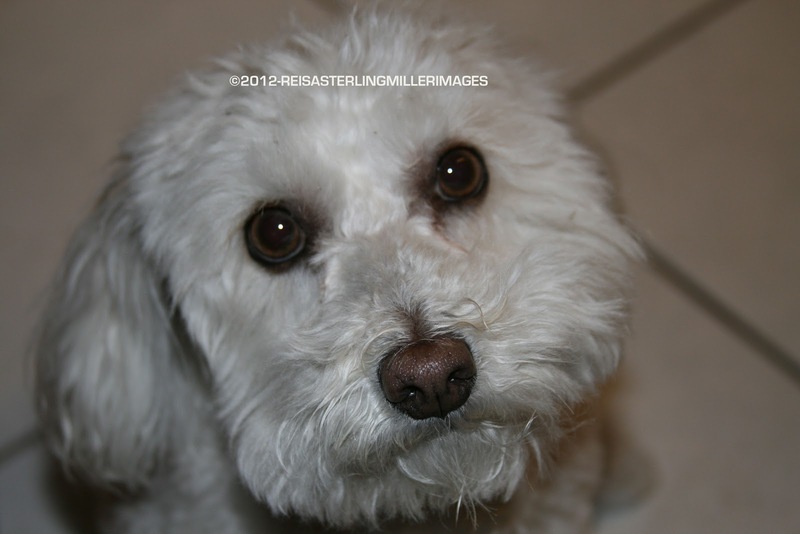 Snuggles is a maltese/shi tzu mix and Sterling is a bichon/poodle mix. When I heard a yip from Sterling it didn't seem like a big deal. When he didn't want to eat, my suspicions started to rise. When he didn't want to get up off the floor and didn't want to walk, the bells were ringing. We rushed him to the emergency vet because this was a Sunday (of course.) We spent several hours there, much of it waiting to see the vet on duty. There were a lot of emergencies that day. They did preliminary tests and took x-rays which showed a disc problem. The vet sent us home with some meds and we were told to keep him as inactive as possible. On Monday morning, we took him to our vet and the drama was on. The disc problem was causing him pain. He refused to eat and drink so he had to stay at the vet with an IV for nutrition and liquid. His weight loss was quick. It was easy to see the difference a few less pounds made on his little body. He spent two additional days at the vet with the IV in him. We took him home for the nights, keeping him in a crib so he wouldn't try to jump up on anything like the sofa or the bed...two of his favorite places. And he was on a regimen of medications for pain, nausea, gastro protection, indigestion, and probiotics. Except for the probiotic which he took willingly, it was a battle to get the rest of the meds down his throat. Trying to get him to eat was another test. I cooked chicken breast for him and he would eat that. But trying to get him to eat the canned stuff the vet sent home was a different story. He wouldn't eat it out of his dish but if I put some in a spoon, along with some chicken breast pieces, he would lick some of it. We spent most of the time during the week, when he wasn't at the vet, either holding him or making sure he wasn't doing much of anything except laying in one of his several beds scattered round the house. In the meantime, Snuggles, bless her little heart, was extremely concerned about him. She hovered near him and we could tell from the look on her face that she was worried. Continuing to reassure her was part of the drama, too. Sterling is still on pain medication for a few more days, but now we will have to make sure he doesn't jump on stuff. A wrong jump could result in paralysis. We'll be getting some doggie stairs for him. Any bets as to whether we can teach him to use them? The cost of all this was unexpected and high. But there was never a moment , not one moment, when we hesitated to do everything we needed to do to get him well, no matter what the cost. Our doggies are family members, bringing us joy, happiness and giggles all the time. There isn't anything we wouldn't do for them. Love my doggies! MY DELETED COMMENT ON HUFFPOST'S JOBS REPORT!